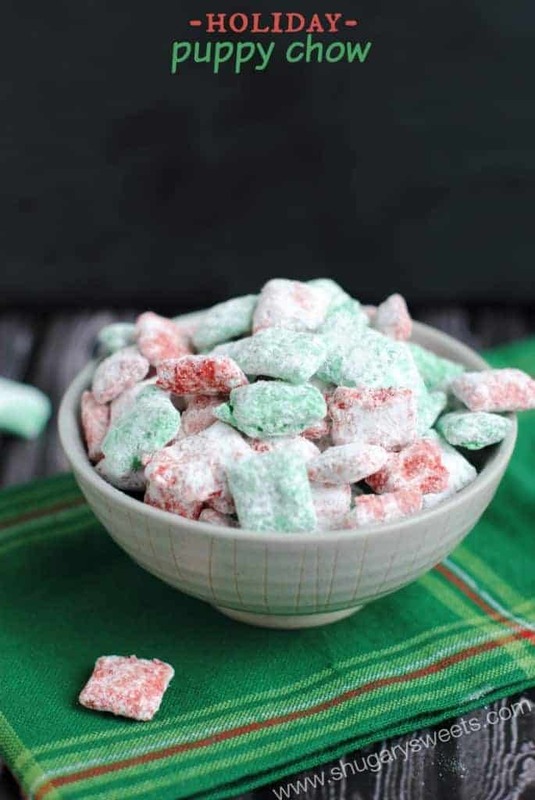 Have fun this holiday season by making a big batch of Holiday Puppy Chow. It’s so easy, festive, and delicious! Love this recipe? Sign up for Shugary Sweets email subscription and never miss out again! I am so excited about today’s recipe. You all know by now that I have a slight obsession with Puppy Chow. And no, I’m not talking about the dog food. This is for human consumption only (so please don’t send me emails that your puppy got ill, haha)!! 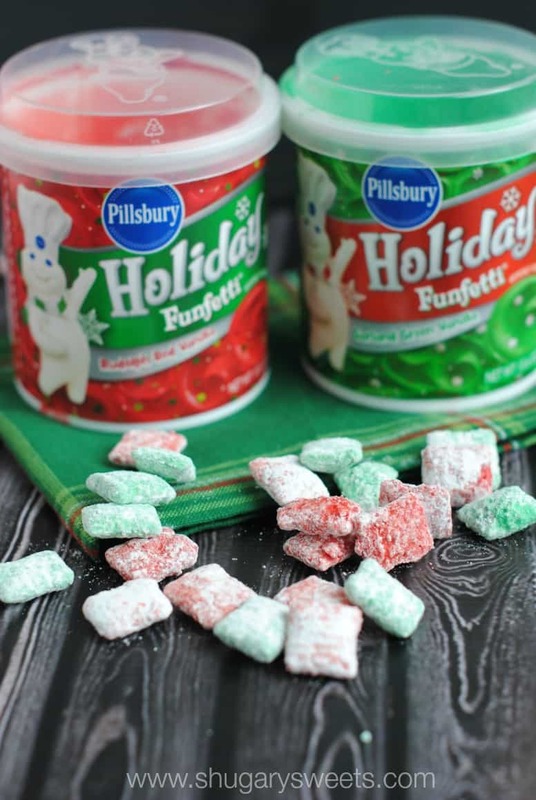 When Pillsbury sent me some of their holiday products to use in today’s recipe, my eyes were drawn to those red and green cans of Holiday frosting! This is the most magical time of year. I feel like I’m walking in a winter wonderland. Okay, yes. I am obsessed with Christmas music right now. I have been playing it since November 1st. But I feel like I can finally relax about my crazy obsession with the holidays because it is now socially acceptable to decorate your house and listen to holiday music (admittedly the decorations in my house were up before Thanksgiving). And, it is also socially acceptable to enjoy holiday treats. All month long! Starting with this delicious, puppy chow. Today’s version is super simple too! And, as you can see, it makes a ton! It’s the perfect snack to make and share with family and friends this season. You can fill large mason jars, wrap some pretty ribbon around the top. Add a tag and voila! Insta-gift. In two large bowls, add 6 cups of the cereal. Set aside. In a glass, microwave safe bowl, add red frosting into dish. Heat in microwave for one minute, stir until smooth (you may need to add another 30 seconds if not completely melted). Add in half of the melted white chocolate. Pour over one bowl of cereal, mixing until combined. In a large plastic resealable bag, add 2 cup powdered sugar. Add contents of bowl to bag. Seal and shake until powdered sugar covers all the cereal. Repeat with the green frosting. Store puppy chow in airtight container for up to 5 days. ENJOY! My favorite holiday treat is anything mint and chocolate that I can pop in my mouth in a bite size fashion. Honestly, the only thing that gets me through the cold weather is the cuteness factor of treats like this one. So adorable! So colorful! 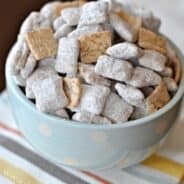 How fun and creative is this puppy chow! Your recipes are never short of amazing! Pinned! What a nice giveaway!! My favorite holiday treat is triple chocolate chunk pecan pie! I can’t eat too much of it, but chocolate and pecans are so good together! Sugar cookies are the best! Gingerbread cookies are my favorite. That’s a tough question, but I would have to say that Peanut Blosson Cookies are my favorite! I love all treats! I can’t really pick a favorite. Thank you for sharing this recipe! Can’t wait to try it! 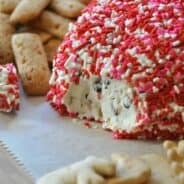 I like white chocolate bark with peppermint. Also white chocolate cheesecake with peppermint! And peppermint tea – all these only at holidays! I love puppy chow and eI love Whoopie pies! Yummo! How’s that cleanse going 🙂 I’m starting one tomorrow but mostly just juice today. But puppy chow…couldn’t have this around. Toooooo tempting! Looks so good & addictive! pinned! I love all flavors of puppy chow! I can’t wait to try these! 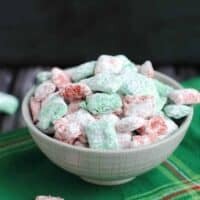 I don’t eat many sweets but my children love all the goodies I make, especially muddy buddies! Fresh coconut cake is my favorite dessert or treat whatever you wan to call it. Homemade layers and 7 minute frosting. YUMMY!!! My mouth is watering now. My favorite holiday treat is Red Velvet Cheesecake. Fudge (any flavor)! Or anything with nuts or chocolate and cherries! My favorite holiday treat is chocolate covered cherries. Aimee these are so festive and fun!! I totally love this and thanks for the raffle! My favvorite holiday treat is pumpkin bread. Mmmm. Making new treat recipes each year is my favorite holiday tradition. Still have the old favorites that we have to have too. Decorated and iced sugar cookies are my favorites. 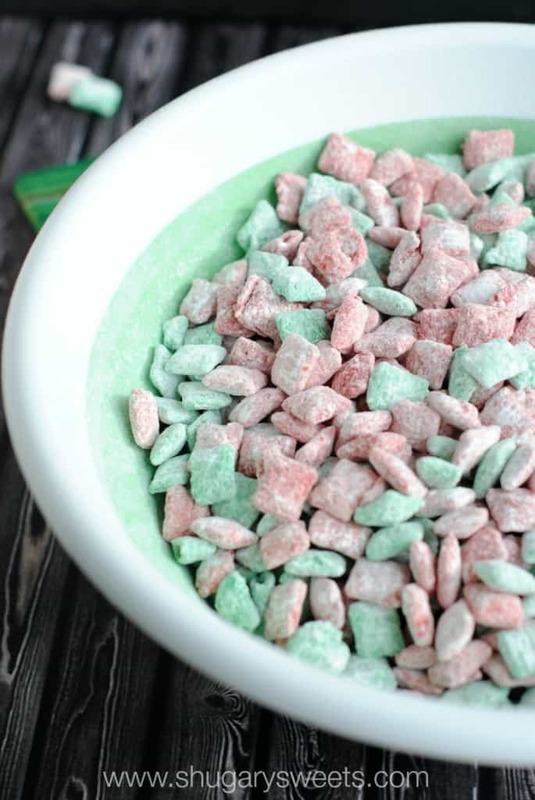 I still haven’t made puppy chow, but this looks pretty awesome. I’m loving the colors!! My grandma’s date nut roll is my favorite! i love cut out sugar cookies! My hands down favorite holiday treat has to be pumpkin cranberry bread… or divinity… or frosted sugar cookies. Oh man. I couldn’t pick just one! 😉 Happy Holidays! Favorite holiday treat would have to be cookies…I’m not picky about what kind…I’ll try one of each but I think my all time favorite would have to be the traditional Nestle Toll House chocolate chip cookies. My favorite are my mother’s homemade sugar cookies! I do love a big bowl of Puppy Chow!!! This is so fun with the red and green!!! we’re making chow for a fundraise, this would be a great addition! Chocolate Pizza is favorite family treat at Christmas (or any time they can convince me to make it). My favorite holiday treat is Meringue cookies, especially ones with chocolate chips in them. Spritz cookies shaped like wreaths. They are pretty and delicious. Also, my mom’s pizzelles. Monkey bread on Christmas morning! I love cookies, but the only time of year I make gingerbread cookies is at Christmas, so I’d say they’re my favorite holiday treat. homefudge and peppermint bark! can’t decide! Oh, my favorite holiday treat would probably be a peppermint martini…drinks counts as treats, right?! Drink’s definitely count as dessert 🙂 Thanks for stopping by Kim! What a great idea! These will work perfect for adding to decorated mason jars for Christmas gifts. I’m not sure what I did wrong here. But this did not work out for me at all. In fact it basically looked curdled and a layer of oil rose to the top after heating was done. I tried it twice just to make sure and I got the same result. Anyone else have this happen? Yes the same daft thing just happened to me!! I was hoping someone else in the comments would have had the same problem and someone else would know the answer!! I was making the. For my kids classes tomorrow but I don’t guess it’ll happen! Not sure how the word daft got into my comment, oops!! I ruined a whole batch of the Holiday PuppyChow ingredients” Do NOT use the frosting. Only use the melted white chocolate chips with food coloring. If you use the frosting, it won’t melt right. Not sure how the frosting got included in the recipe. Okay. I tried making these. Epic fail. I went to the grocery store and they were out of almond bark. The clerk said Wilton candy melts would work the same so I used them. I don’t know if that is why this didn’t work or what but everything globbed onto the rice chex and did not look at all like the picture. They were not pretty like in the picture and were so sweet you couldn’t even eat them and I like things sweet. This was a big waste of good money on ingredients. Luckily I made a small amount as a trial and so was able to use the rest of the frosting on sugar cookies. I personally don’t think Wilton Candy Melts taste good (they are quite waxy). Sorry you had troubles and couldn’t find the almond bark! I’m sorry for the confusion, it’s 1/4 cup of each color for 12oz vanilla bark! 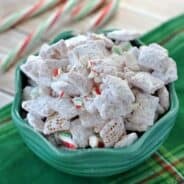 I tried this holiday puppy chow, and it was good right after I made it, but now even a couple of hours later, it is soggy. I’m not sure what I did wrong. Same problem! Great right after I made it, but too soft/soggy the next day. Had to throw it all out. I found it works with just the frosting. I used 1/2 cup of frosting and roughly 8 cups of cereal. It wasn’t too sweet.